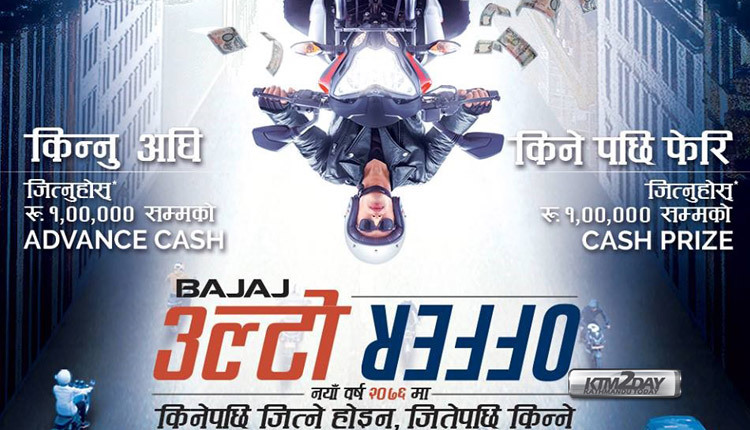 Hansraj Hulaschand and Co, the sole authorised distributor of Bajaj motorcycles and the largest motorcycle selling company in Nepal, has announced its New Year campaign ‘Bajaj Ulto Offer’ with the line ‘Kinay Pachhi Jitney Hoina Jitay Pachhi Kinney’(किनेपछि जित्ने होइन , जितेपछि किन्ने ). The scheme is totally opposite to previous schemes, hence has been named “Ulto Offer” (उल्टो OFFER) . Earlier, customers were given cash or discount only after the purchase of any motorcycles but in this offer customers will get a scratch card before purchasing the bike to know the sureshot discount and then again will get another chance after the purchase of any Bajaj motorcycle. In this offer customers can receive advance cash of up to Rs one lakh prior to buying any motorcycle. Besides that, customers can also get cash prize of up to Rs one lakh after purchasing any Bajaj motorcycle from any authorised dealer. Customers willing to purchase Bajaj Motorcycles this season can fill out the form at Bajaj’s website or visit the nearest showroom.